The S7 Technics aircraft maintenance facility located some 100 kilometres from Mount Elbrus – the highest mountain peak in Russia and Europe – is in the throes of reaching its own pinnacle with the implementation of lean manufacturing tools and AMOS software, whilst steadily building its range of competences in the provision of re-delivery checks on western-built jet airliners. In its all-embracing modernisation campaign, the company hopes to reach its next milestone before the end of this year by launching a dedicated facility for maintaining the world’s most popular commercial aircraft engine, the CFM56. The facility would then be only the second in Russia capable of doing this. 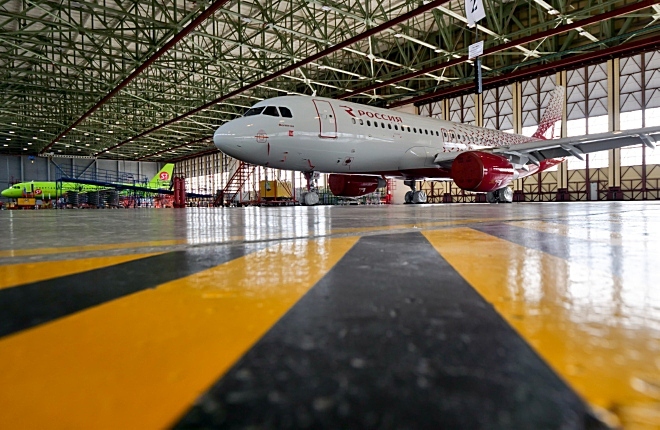 This story of S7 Technics’ Mineralnye Vody base, which generated 13 per cent of the maintenance company’s total business last year, is part of a series of reports by Russian Aviation Insider’s sister publication ATO.ru on Russia’s leading MRO bases in Russia. 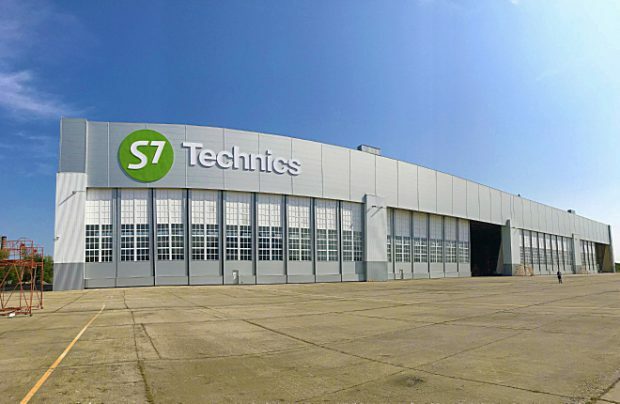 The aircraft maintenance base at Mineralnye Vody is the third such specialist repair shop in the business portfolio of S7 Technics, the largest provider of aircraft maintenance, repair and overhaul [MRO] services in Russia and the CIS. The facility was launched on July 15, 2010 at the premises of the former Civil Aviation Plant No. 411, located in the north-eastern sector of Mineralnye Vody airport (IATA code: MRV). S7 Technics recalls the moment the acquisition took place and when the condition of the floors in the former plant dating back to the Soviet era was far from perfect. The decrepit facility also had no heating, the roof was partly destroyed and the inner walls required substantial repairs. So the first requirement, ahead of winning certification to EASA standards, was to repair and reconfigure the damaged buildings. Over the following years, S7 Technics has completed a catalogue of rebuilding and modernisation works at its Mineralnye Vody base. Now S7 Technics’ Mineralnye Vody base is capable of providing all types of maintenance services for Boeing 737-300/400/500/600/700/800 (CFM56-3/7 engines) and Airbus A319/320/321 (CFM56-5A/B and V2500 engines) under the company’s EASA Part 145 approval; as well as line maintenance services for the Sukhoi Superjet 100 (SSJ 100) under Russian FAP-285 certification. 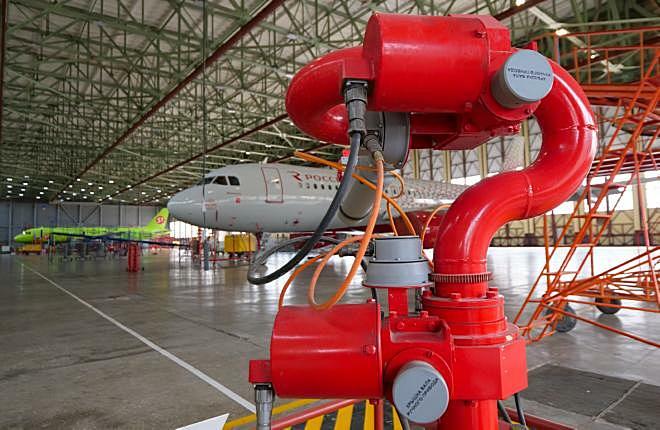 The upgraded base performed its first C-check on a Boeing 737 aircraft in April 2011, and for an Airbus A320 in May of the same year. The repair shop has been dealing with SSJ 100s since the spring of 2016. Apart from airframe repairs, the base is also approved for the maintenance of on-board galley equipment (coffee-machines and ovens) and accumulator batteries. 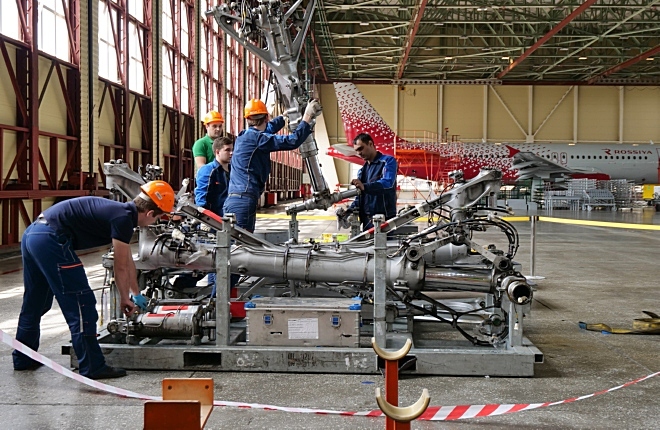 Local specialists are able to handle repairs of a long list of units and components for Russian-made aircraft, which includes more than a thousand items for Ilyushin Il-76, Il-38, Tupolev Tu-204, Tu-154B/M, Tu-134, Yakovlev Yak-40, Antonov An-24/26, An-74, An-2, Kamov Ka-32 and Mil Mi-8 helicopters and its modifications; as well as APUs including TA-6, TA-8 and TA-12, and navigation and radio equipment, hydraulic actuators, fire extinguishers, oxygen bottles and so on. The Mineralnye Vody MRO hangar can simultaneously accommodate two aircraft for periodic maintenance, plus an additional narrowbody for painting. Overall, it offers enough space for up to five narrow-body aircraft. It is not surprising that the development of this facility has strengthened the market position of S7 Technics, Ilnur Shakhmaev insists. “The launch of the paint shop enabled S7 Technics to enter the international aircraft painting market. Another important asset is the remaining available space, which can be used for launching additional facilities, such as a dedicated engine maintenance shop,” he explains. 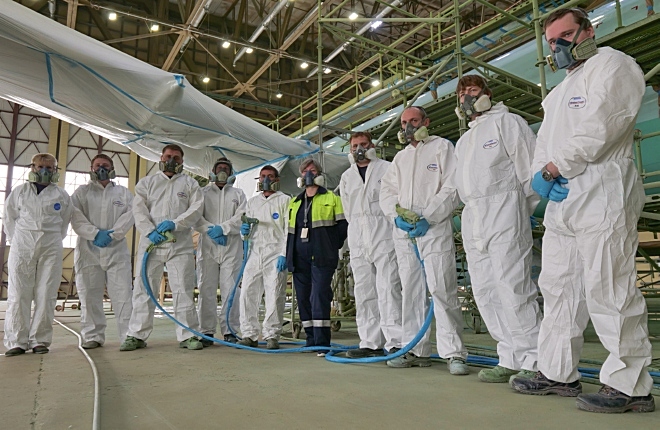 Today, Mineralnye Vody is the only maintenance base located in the south of Russia which is capable of conducting all checks on Boeing 737CL/NG and Airbus A320 family aircraft and the complete painting of narrow-body aircraft. One significant positive factor for S7 Technics’ southernmost base is its location in a Russian geographical zone that enjoys favourable climatic conditions, thereby saving energy and heating costs at the production sites. The location’s weak points, though, include Mineralnye Vody’s relatively underdeveloped airport with no transit flows – and the significant lack of a major base carrier. Nevertheless, in assessing the role and the position of this base on the Russian aircraft MRO market, Ilnur Shakhmaev claims that, in terms of all-inclusive maintenance and painting projects, “we’re number one in the Russian market.” On the wider regional scale, he observes that similar services are offered by “less than a handful of providers, such as one in Estonia” (referring to Magnetic MRO) and therefore there are no rivals for this facility in regard to its geographical location. The nearest competitors are Turkish maintenance providers and the distance between Mineralnye Vody and Istanbul is 1,200 km, which is comparable to the distance between Mineralnye Vody and Moscow. Apart from the in-house painting facility, S7 Technics’ Mineralnye Vody site has at least one other special dish on its menu. It is here, where the company completes all of its contracts for those re-delivery checks required when an aircraft changes operators. The facility’s first re-delivery check was performed in October 2016 on Airbus A319 operated by S7 Airlines. 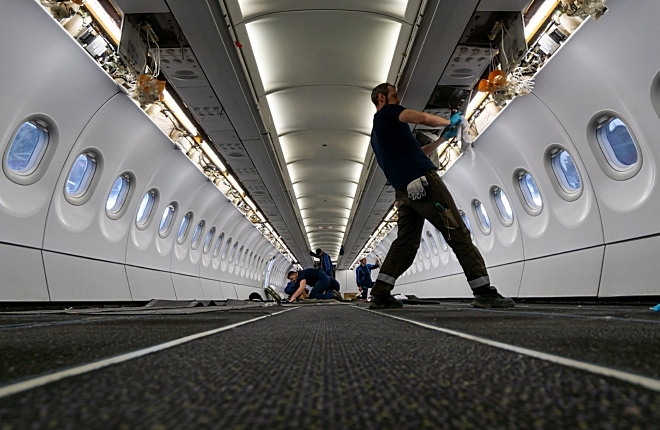 The next project was completed in December of the same year on an Aeroflot Airbus A320. In just two years, the company has performed 12 such re-delivery checks, and expects that number to grow. “Considering the large number of successfully completed re-delivery checks, the Mineralnye Vody base may now be considered a centre of competence for such types of operations,” Shakhmaev boasts. “Thanks to having our own on-site, in-house painting shop, we have been able to include the provision of a finished new livery on an aircraft as part of our re-delivery offering, thereby making the total re-delivery process much easier. This also saves the unnecessary combined costs of ferrying an aircraft to a remote painting facility and the increased aircraft downtime while it awaits a painting slot. Re-delivery projects can be quite complicated, and there’s often a large number of factors involved which require the input of specialists from S7 Technics’ engineering centre. That’s why, throughout the entire re-delivery check, there is constant contact between people at our site, the operators and the lessor,” he adds. The Mineralnye Vody-based MRO provider initiated lean production principles last year. The 6S concept was introduced first and soon proved its efficiency, Andrey Yurchenko says. It was followed by the introduction of production control boards and process visualisation. The production floor was reorganised to enhance efficiency measures, and special zones were set up for the storage of tools and equipment. “Implementing and promoting lean production principles is one of our main strategies,” the head of production emphasises. In terms of using IT systems, the Mineralnye Vody site is streamlining and synchronising its development in line with all sister companies in the S7 Technics portfolio. One of the latest additions – an SMS request system for expediting the delivery of parts and equipment – was designed by S7 Information Technologies, as was SRS request, which facilitates the timely release of repair cards. In early 2018, the company inaugurated AMOS, sophisticated software solution designed by Swiss-AS. S7 Technics’ experts believe that AMOS is one of the best such systems for the aircraft MRO industry. “Our leading employees are now involved in the process of implementing [this software]. At present the system is being implemented across the holding structures, and our specialists are already using AMOS,” Yurchenko reveals. Apart from the implementation of AMOS and lean production practices and the certification of the new engine maintenance facility – moves which are expected to further strengthen S7 Technics’ position in the CFM56 support market – the Mineralnye Vody site is embarking on yet another large-scale project: certification by EN 9110:2016, the international quality standard benchmark for the aviation industry. “With the EN 9110 certificate we’re on track to becoming the second organisation in Russia, after Domodedovo (Moscow)-based S7 Engineering, with this endorsement. This project is in full swing now,” Ilnur Shakhmaev reveals. The EN 9110:2016 accreditation is based on ISO 9001:2015, which defines the principal requirements for a quality management system [QMS} in an aircraft maintenance organisation. “A QMS built-in compliance with EN 9110:2016 standards helps to fine-tune the management of a company through re-organising processes and then measuring their efficiency against a scale of indicators, which helps to identify and eliminate weaknesses in an organisation. Those main indicators are service safety, compliance with quality standards, the timely delivery of services, and customer satisfaction,” explains Oleg Golomolzin, S7 Engineering’s director for quality. The main advantage of an EN 9110:2016-driven QMS is its systematic approach to running an organisation in compliance with IAQG recommended practices, including those not covered by EASA Part 145. Although the major infrastructure repairs of S7 Technics’ Mineralnye Vody operation are largely complete, the company’s management says that on-the-spot modernisation improvements will continue. The buildings will be further repaired, as well as the adjacent territory, including aircraft stands and engine run-up areas. “There will be spot improvements in line with [changing] customer requirements and our own expectations of the market potential. We will continue to develop our base to deliver the full cycle of operations necessary for the re-delivery of an aircraft to its next operator, including the complete refurbishment of cabin and flight deck and so on. 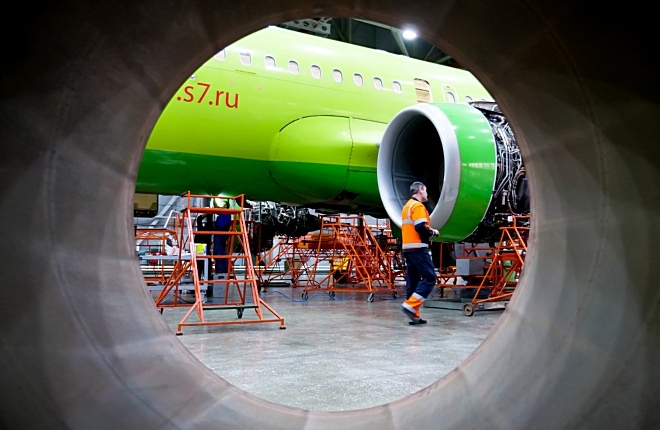 We are constantly researching and analysing the market for further opportunities to offer new maintenance service options, both for western- and Russian-made airliners,” Shakmaev notes. The success story of S7 Technics’ development of its Mineralnye Vody operation is hard to imagine without a coherent on-site human resources policy at a base that now employs some 300 people. The latest recruitment process includes several advanced human resource practices, Shakhmaev says. “First of all, we emphasise our comfortable working conditions and the fact that those employees who relocate from other cities receive a partial compensation for their personal accommodation,” he reveals. The company is also in close cooperation with several higher education institutions, including Samara’s Sergey Korolev National Research University and the Don State Technical University. Another partnership, with the Taganrog-based Institute for Radio Systems, is planned for 2019. “Students of these universities regularly have their on-the-job training here at Mineralnye Vody, which gives them an opportunity to support their theoretical knowledge with hands-on experience with a supervisor. At the same time we have the opportunity to assess and attract prospective young recruits for further employment with us,” Andrey Yurchenko explains. S7 Technics is going even further by working closely with schools and colleges, offering regular guided tours for schoolchildren. There’s also a current group of future aircraft mechanics receiving their education at the local Regional Multiprofile College, and on-the-job training at the S7 Technics’ site. The S7 Technics’ Mineralnye Vody site has an estimated current production capacity of 305,000 man-hours. At the end of 2017 its load coefficient reached 75 per cent, having almost doubled in the last five years. The site is less and less involved in light maintenance activities, such as A-checks, as customers are increasingly reliant on it for more complicated services such as C-, D-, 6YR/12YR and re-delivery checks. “In 2018 we expect to enjoy a more evenly-spread production workload, to further increase our re-delivery check competences, the certification of the new engine maintenance facility and further implementation of the lean production methods,” Shakhmaev concludes. Civil Aviation Plant No. 411, created in 1944, was a large aircraft maintenance enterprise. 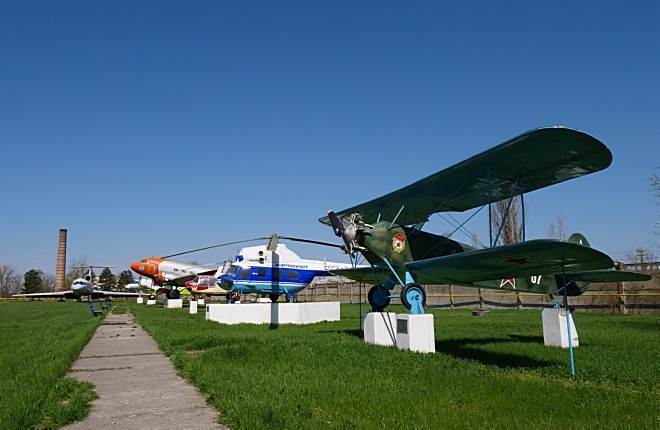 Throughout its history it serviced such types as the Li-2 (in the 1944-1976 period some 4,000 aircraft were repaired), the Mi-1 (1957-1973, 1,560 helicopters), the An-2 (1959-1960 and 1999, 175 aircraft), the Mi-2 (1970-1987, 3,664 helicopters), the Yak-40 (1972-1984, 1,393 aircraft) and the Tu-154 (from 1979). In 1991 the plant added the servicing of a record number of 59 Tu-154s to its history. At that time, staff numbers exceeded 2,000 people but, by the end of the 1990s, the number of Tu-154s maintained by the plant had dwindled to a mere dozen. Nevertheless, the resultant number of Tu-154s repaired by the plant stands at 600 aircraft of the –B modification and more than 40 of the –M variant. In its most recent history, the Civil Aviation Plant No. 411 was a joint-stock company and was apparently incapable of re-inventing itself into the role of a maintainer of western-built aircraft, finally going out of business in the spring of 2009.